Edirne's historic wrestling field is getting a facelift to make it a year-round tourist attraction. Turkey’s annual Kirkpinar oil wrestling competition will soon become a tourist attraction. The mayor of Edirne, the city that hosts the annual sporting event, has just announced plans to have the city’s historic wrestling field open to visitors year-round where they can also witness demonstrations of the sport. Edirne’s mayor, Recep Gürkan, told the state-run Anadolu news agency that the municipality is modernizing the field with assistance from the Ministry of Youth and Sports in time for the 657th competition to be held from July 2-8, 2018. He added that talks are underway with tour operators to bring tourists to the square once it’s complete where they can witness demonstrations of the sport for a small fee. This new attraction should provide a boost to tourism and increased revenues for the city, located in a corner of northwestern Turkey close to the country’s borders with Bulgaria and Greece. The Kirkpinar Oil Wrestling competition is a popular annual sporting event that has been held every year for the past 656 years. Before battling it out on a grassy field, the wrestlers who are clad in long shorts of black buffalo hide called “kispet,” are slathered in olive oil. The annual event attracts thousands of spectators. Wrestlers from every corner of Turkey qualify in regional events to make it to Edirne for what many consider Turkey’s equivalent of the Super Bowl. In 2017, over 2,200 wrestlers took part. 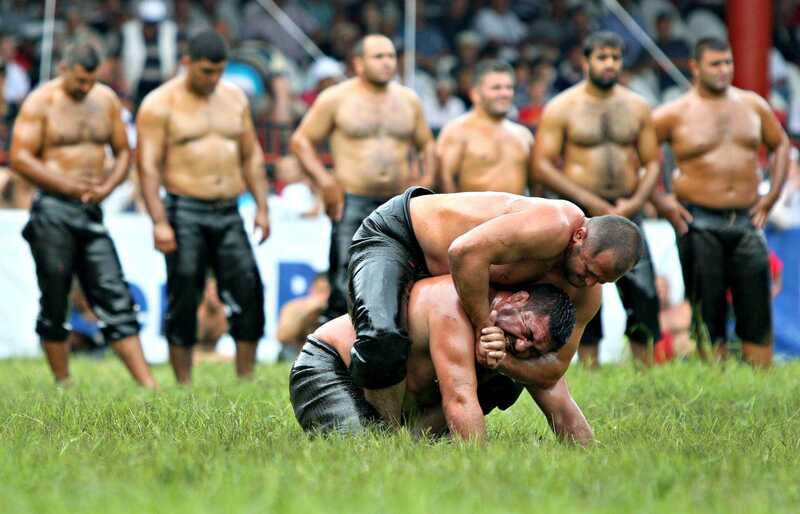 Dating back to 1357, Kirkpinar Oil Wrestling may be the world’s oldest annual sporting event and is inscribed on UNESCO’s list of Intangible Cultural Heritage of Humanity. It’s the only wrestling tournament in the world where competitors are covered in oil. Olive oil is preferred over other kinds of vegetable oil because it’s considered to be good for the skin. A suggestion a few years ago that sunflower could be a cheaper replacement was met with outrage on the part of the wrestlers. Balaban narrowly missed out on the title in 2013, when he was beaten by Ali Gürbüz, who was later stripped of the title when he was exposed as one of 16 oil wrestlers who had tested positive for banned substances. The defending champion in this year’s event is Ismail Balaban, a farmer’s son from the Akmay village of Elmali who beat Orhan Okulu to take the 2017 title. Olive oil's premier event continues to draw more people with each edition of its annual gala.